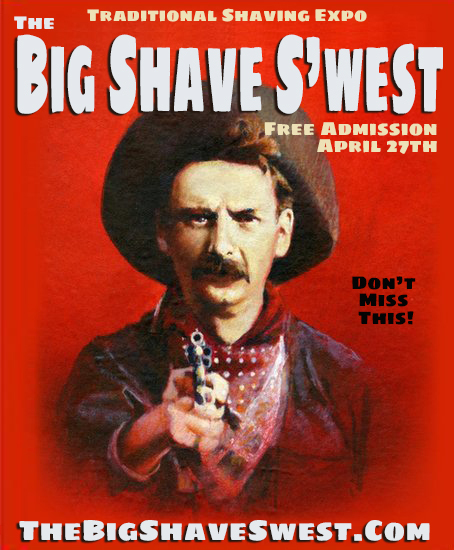 The Big Shave S'west Vendor Line Up - Be There April 27th! 40 days away people! As promised, here is the current vendor (on the scene) list with possibly more to be added! 20 Awesome Vendors so far! Pacific Shaving - Blackland Razors - Karve Razors - Edwin Jagger - The Holy Black - Phoenix Shaving - Razor Emporium - King Shave - Gentlemen's Nod - Colorado Razor Designs - Henri Et Victoria - Van Yulay - Wet Shaving Products - Razors By Jerry Stark - Be Shaven - Rich Man Shave - Cooper & French - Frugal Shave - Wild West Brush Works - Bluesman Blades - Sharpologist and The Gentleman Scofflaw! Also, for those that show up earlier in the week, don't forget about our Tombstone Day Trip on Thursday and Baseball Game on Friday evening! NEW Excursion: Cigar & Pipe happening! That's right folks, Marty Pape & Jordan Jordan A. Crowder are putting together something for Friday also, for folks that won't catch the ballgame. More info coming on that in this weeks newsletter! As always, thanks so much for the support my friends, you all rock! For more info please visit the official site: http://thebigshaveswest.com or email me directly! Artisans: We still have a little room left if you are still considering attending this years Epic Expo! (03-18-2019, 08:18 PM)CaD314 Wrote: Pacific Shaving - Blackland Razors - Edwin Jagger - The Holy Black - Phoenix Shaving - Razor Emporium - King Shave - Gentlemen's Nod - Colorado Razor Designs - Henri Et Victoria - Van Yulay - Wet Shaving Products - Razors By Jerry Stark - Be Shaven - Rich Man Shave - Cooper & French - Frugal Shave - Wild West Brush Works - Sharpologist and The Gentleman Scofflaw! Sounds like a good time, hope it goes great for you and all who attend. I noticed that on the event website, the header image includes more vendors logos than you just listed. To name a few that stood out as I'm more familiar with them: Top of the Chain, Lather Bros, Soap Commander, Pasteur Pharmacy, Karve, The Blades Grim. I'm just curious if those that I mentioned are still all down as maybes or whether they were maybes when you made the website graphic but they've since each let you know they can't make it? None of the above, those are sponsors my friend, just like DFS. Without their support the event would not happen! That said, Canada has made quite a showing this year...I'm thinking we need a Big Shave Great White North ! Thanks brother, wish you could make it! KARVE will be on the scene now too! Woot!!! Have fun to all those that are going. I would like to check one out sometime if it’s ever closer to my area.